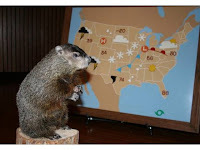 MWN Blog: Groundhogs disagree on spring; MWN says it won't be in the next week! Groundhogs disagree on spring; MWN says it won't be in the next week! The Mid-South "dodged a bullet" yesterday as a massive and crippling winter storm paralyzed areas from the southern and central Plains through the Mid-Mississippi Valley and Midwest into the Northeast, adversely affecting over 100 million people. Many places are measuring snow and drifts in feet this morning, while others are dealing with major power outages caused by significant ice accumulations and high wind. To our south, strong thunderstorms swept across the Gulf Coast states. Meanwhile, the Mid-South got a good dose of rain and some thunder, very gusty wind behind the cold front, and much colder temperatures. It could have been much worse. We'll get a short, albeit cold, reprieve for a couple of days before the next storm system affects the region. That will come in the form of low pressure that will form along the Gulf coast and move northeast. The Mid-South, particularly north Mississippi, will be positioned on the north side of that system and will receive precipitation. Right now, I expect scattered light rain showers during the day Friday as temperatures sit in the upper 30s. However, as colder air wraps around the backside of the low Friday night, rain will change to light snow. Amounts should generally be 2" or less, with the highest totals (of 2" or so) south of the metro area and lesser amounts to the north. I am thinking the city proper may see an inch from this system, which would likely all melt on Saturday. The GFS forecast valid Friday night is shown below. The blue dashed line labeled "540" is usually a good approximation of the rain/snow line. After another short break, the next system arrives early next week. This one could be a little more potent and there is the potential for more snow Monday or Tuesday. This storm is still several days out and model forecasts will change several times between now and then. We'll continue to monitor and keep you updated. More certain than the potential snow amounts is that Arctic air will spill in behind that system, perhaps bringing the coldest temperatures of the winter so far. Early model forecasts indicate the possibility of lows in the single digits and highs in the teens by the middle of next week!